Fight #1 – 185 lbs. 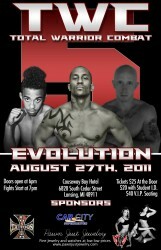 Winner: Eric Shumocker at 1:27 in round 1 by tap out due to rear naked choke. Fight #2 – 170 lbs. Winner: cheap nfl jerseys Calvin Sullins at 1:31 in round 1 by TKO – referee stoppage due to strikes. Fight #3 – 155 lbs. Winner: Cody Hannah at 43 seconds in round 3 by tap out due to rear naked choke. Fight #4 – 205 lbs. Winner: Sam Duister at 1:21 in round 1 by tap out due to triangle choke. Fight #5 – 155 lbs. Winner: Jarell Singleton at 2:07 in round 1 by knock out. Fight #6 – 145 lbs. Winner: Mike Thompson at 51 seconds in round 2 by corner stoppage. Fight #7 – 170 lbs. Winner: Roderick Lewis at 40 seconds in round 2 by TKO – referee stoppage due to strikes. Fight #8 – 155 lbs. Winner: Antoine “The Tank” Williams by unanimous decision (30-27) after three hard-fought rounds. Fight #9 – 140 lbs. Winner: Ray Reynero at 2:31 in round 1 by TKO – referee stoppage due to strikes. Fight #10 – 170 lbs. Winner: Skeeter Kittle by split decision after three grueling rounds. Winner and NEW CHAMPION: Nic “The Nightmare” Booth at 1:43 in round 4 by tap out due to arm bar. Winner and NEW CHAMPION: Josh Shaw at 1:24 in round 1 by TKO – referee stoppage due to strikes. Winner and STILL CHAMPION: Eddie “The Machete” Tamez at 2:11 in round 1 by tap out due to armbar. Winner and NEW CHAMPION: Thomas Duncan at 1:42 in round 1 by doctor stoppage due to a cut. Knockout of the Night goes to Jarell Singleton for his smooth 1st round KO. Submission of the Night goes to Eddie Tamez, who pulled off a textbook armbar out of nowhere. Fight of the Night goes to Skeeter Kittle and Denato Richardson, who went the distance in a battle that kept the judges on their toes. Tagged Adam Molnar, Antoine Williams, Calvin Sullins, Cody Hannah, Dan Dunbar, Denato Richardson, Dru Gardner, Ed Pigeon, Eddie Tamez, Eric Shumocker, Jamie Lange, Jarell Singleton, Joel Chapman, Josh Shaw, Mike Thompson, Nic Booth, Pete Keung, Phil "The Voice" Davey, Phil Davey, Ray Reynero, Roderick Lewis, Sam Duister, Shae Brophy, Shannon Hale, Skeeter Kittle, T.J. Corwin, Thomas Duncan, Total Warrior Combat, TWC. Bookmark the permalink.